Tarallucci and Vino just opened a new location at 44 East 28 Street and I couldn’t be happier. Michele and I attended a “soft opening” dinner last night and it was terrific. First of all, it is a great looking place with a large outdoor area, spacious bar room and comfortable dining room. The owner Luca Di Pietro greeted us and immediately offered us glasses of Pecorino, which was very welcome and refreshing on a hot night. Lorenzo Baricca, the wine director, whom we had met on a wine trip several years ago, is a partner. He proudly showed us his impressive collection of older wines going back to the 1960’s. We began our meal with some appetizers. Burrata cheese with roasted baby eggplant for Michele and grilled octopus with potatoes, celery and caperberries for me. There was also an appealing list of small plates for sharing, such as fried polenta, ‘nduja with mascarpone and tomato, and pancetta with a confit of shallots. These weren’t available for the preview dinner, but they sounded delicious. while I opted for the Agnolotti, ricotta-filled ravioli sauced with mushrooms, hazelnuts, and basil. We also had a side dish of roasted eggplant. To finish off the wine, we ordered a cheese course. Three cheeses appeared: Parmigiano Reggiano, gorgonzola and robiola, all of them in perfect condition. A small bowl of good honey topped with chopped almonds accompanied the cheese. and Michele had the panna cotta with verbena and peaches. The wine list is extensive but not overwhelming. Lorenzo has some unusual wines on the list such as Caprettone, a white from Cantina Olivella, the aforementioned Pecorino, and a Nero D’Avola which we also sampled. The highlight for me was the bottle of Benanti Etna Rossa “Rovittello” 2004. The older wines on the list include the 1962 Barolo Riserva Speciale from Marchesi di Barolo ($250) and Rivetto Barolo 1966 ($150), which are very well priced. “Tutto finisce a tarallucci e vino,” is an old Italian saying meaning that it all ends well. What an appealing thought and we totally agree! 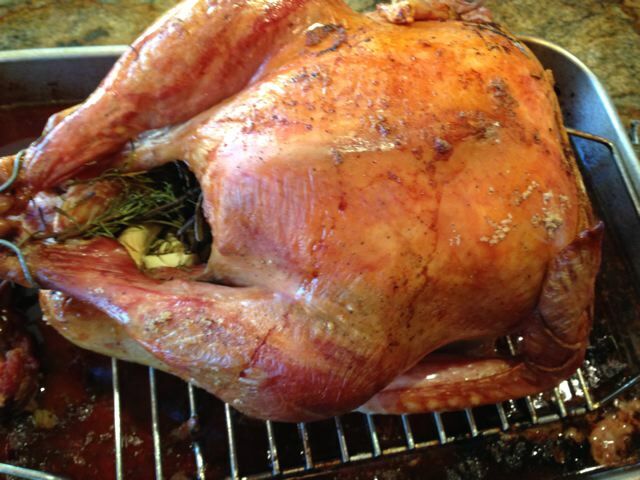 This year Thanksgiving lunch started at 3:00 PM instead of the usual 4:00 PM. There were six people and six bottles of wine. Ernie and Louise De Salvo, and Travis Scott and Nicole Serle – owners of Turtledove wine store in Manhattan joined Michele and I. It was a fun evening with great food, wine, company and a lot of laughing. We started as always with Champagne. 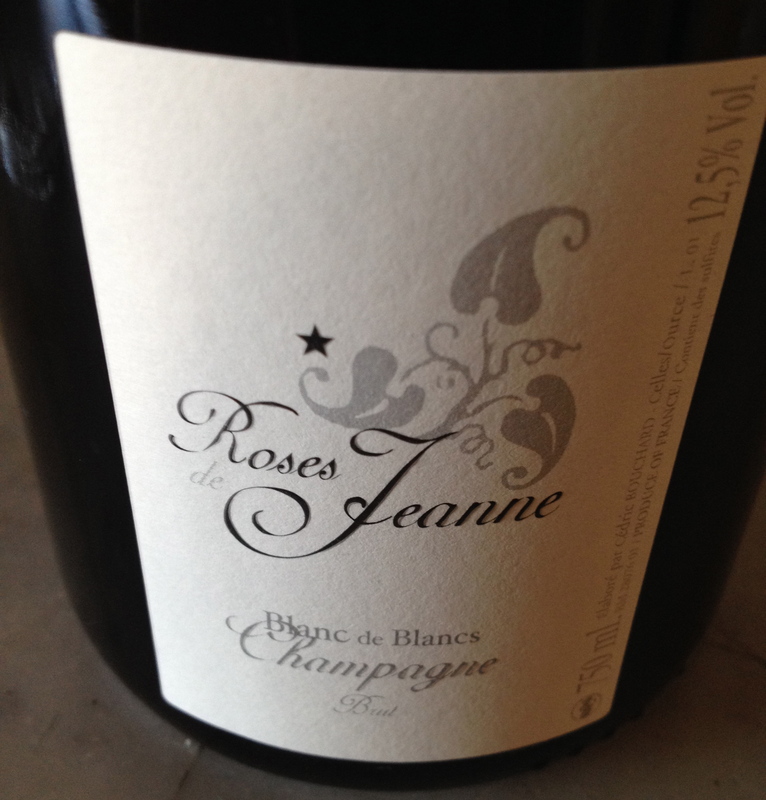 Champagne Roses Jeanne Blanc de Blancs Brut 2009 100% Pinot Blanc Cédric Bouchard. The champagnes from this producer always impress me. The vineyards are farmed using organic methods and simple guyot pruning. There are 8,000 vines per hectare. Grapes are hand harvested and crushed by foot. Fermentation takes place with indigenous yeast in stainless steel tanks. The wine is unfiltered and unfined and low or no dosage depending on the vintage. I believe they produce only single vintage, single vineyard wines that are fermented and aged in stainless steel with as little interference in the process from the winemaker as little as possible. The bubbles were very small and the wine had a crisp, fresh taste with bold citrus fruit flavors. It worked very well with the smoked salmon mousse Michele served as an appetizer. The first course was a chestnut soup, which was made by Louise, a great cook and bread baker. With the soup we had the legendary Fiorano Rosso Vino da Tavola 1973 Cabernet Sauvignon and Merlot Boncompagni Ludovisi Principe di Venosa. I love this wine and it had that great combination of leather and cherry that makes it so wonderful and unique. Michele stuffed the turkey with fennel, rice and sausages and there were maple whipped sweet potatoes and Brussels sprouts. Michele made a mostarda of figs and cranberries that I could not stop eating. I like Amarone with Turkey and all of the trimmings. These were exceptionally good. Amarone della Valpolicella Classico 1997 & Recioto della Valpolicella Amorone Classic Superiore 1983 Bertani. 70 % Corvina Veronese 30% Rondinella-this is the present blend. Carefully selected grape bunches are hand-harvested in Bertani’s best Valpolicella vineyards in Fumane, Marano and the Novare Valley. Vines are cultivated using the “spalliera” method while pruning is done using the guyot method with 5,000 vines/ha. Unlike most leading Amarone producers, who buy grapes from outside growers, Bertani’s harvest originates entirely in the firm’s own vineyards. With marly-calcareous soil sheltered by surrounding woodland, these vineyards offer the ideal terroir for Amarone. dry, full-bodied, and amply structured with hints of cherries, red berries and spice a great wine and was not showing any signs of age. Both 1997 and1983 were excellent vintages for Amarone. 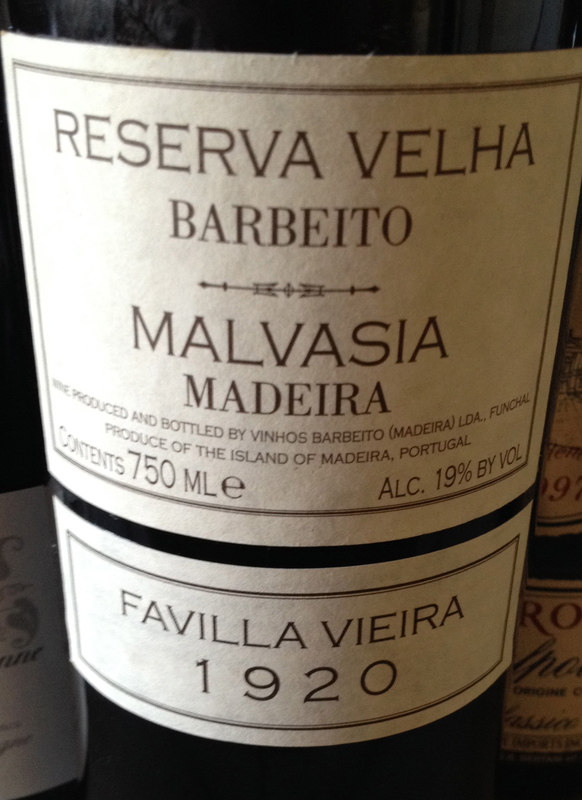 Malvasia Maderia Favilla Vieria 1920 Reserva Velha Barbeito 100% Malvasia. 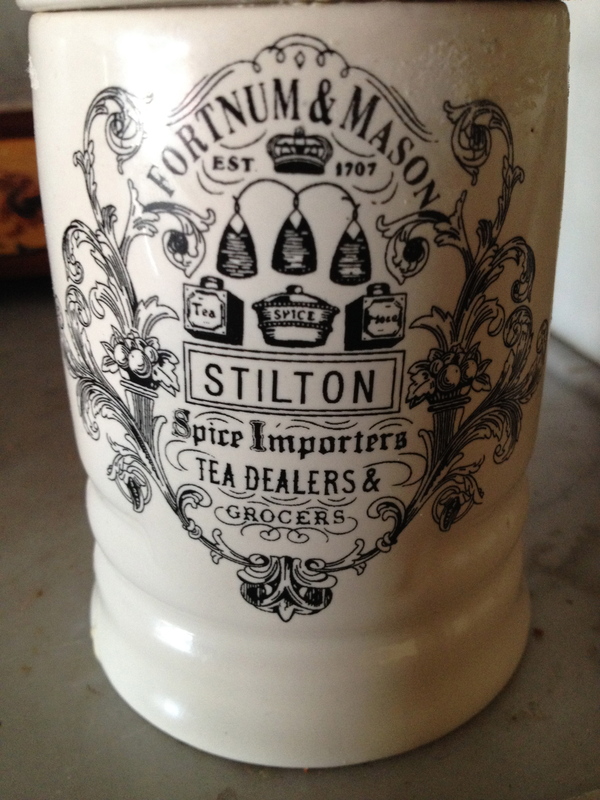 We had this with a Stilton cheese that we had purchased in Fortnum & Mason when we were in London a few weeks ago. This was a very elegant Madeira but with enough body to make it a perfect combination with the cheese. For dessert Michele made an apple tart tartin and prune ice cream made with Agen prunes macerated in Vielle Prune liqueur. It was the perfect way to end a great evening. When I was talking to Giovanni Bertani of the Tenuta Santa Maria Alla Pieve winery last year about Amarone he mentioned that they had a number of bottles of Recioto from the 1928 vintage and the wine had a very unusual history, He said that next time he came to NYC he would bring some of the bottles to taste and explain their unique story. Giovanni was a good as his word and next time I saw him I was able to taste a wine that was 85 years old. Giovanni said that the name Acinatico derives from the Latin, acinaticum, signifying grape or grape stone, and is the ancient name for Veronese Recioto wines. The 1928 vintage was a blend of grapes, Corvina, Corvinone, Rondinella, Molinara and Sangiovese, and was exposed to an unusually extended drying period at the Bertani family cellars in the Valpolicella-Valpantena DOC. He said that Piero Venturi, a long-time cellar master, vividly recalled the singular conditions of the 1928 vintage: hot, above-average temperatures and little precipitation, followed by an exceptionally cold, dry winter – in short, ideal conditions from which to produce a Recioto of truly outstanding quality. According to Venturi, the grape skins were exposed to a particularly long maturation, favoring especially high sugar content. 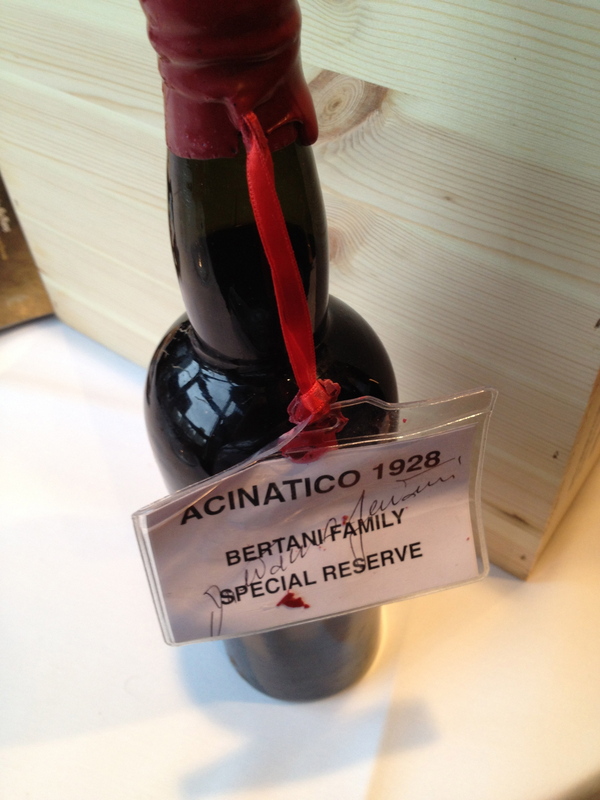 The 1928 Acinatico was aged in a 60-hectoliter oak barrel, which exists to this day. In 1938, after about 10 years of barrel aging, the wine was bottled in specially purchased handmade bottles bought from a supplier in Verona. Such bottles were reserved exclusively for use with the finest wines of the period, such as Recioto, Marsala and Port. In 1940, soon after the outbreak of WWII, German soldiers were staying in a villa adjacent to the Bertani family’s cellar. Faced with loss of their entire stocks to thirsty German troops, the family determined to preserve at least their very best wines. Giovanni said he was told that the German troops were drinking and breaking everything in sight. The Acinatico was discreetly moved to the family’s Saccole farmstead. They borrowed bottles from all their neighbors to bottle the wine that was still in the barrel and carefully walled them in, to remain lost from sight and from mind, destined not to see the light of day for the next 40 years. That was until 1984 when laborers carrying out construction work uncovered this extraordinary and forgotten cache of wine. Wood cases containing 7,500 bottles of the precious wine were carefully removed and returned to their original resting place in the Bertani family cellars as an important part of the family’s heritage. Giovanni said that tastings showed that the wine was perfectly conserved and its enological condition was spectacular, due to the excellent storage conditions, a 17.8% alcohol content and an acidity level of 0.33%. He reports that a bottle recently opened was re-corked and then subsequently re-opened the next day – its freshness was astonishing. Soon after the bottles were discovered, a decision was made that they would not be sold but preserved instead for special occasions. Four bottles were, however, put up for auction by Christie’s New York on January 12, 2001 and sold to a single buyer for $9,200. Giovanni said that about 2,500 bottles remain in their cellars today. I could not believe that this wine was so old. It is complex, elegant and well balanced. It had all the classic aromas and flavors of a classic mature Recioto, cooked prunes, raisins, figs, chocolate and a touch of spice. When in Rome last June, Michele and I enjoyed lunch at Pier Luigi, a favorite restaurant for fish. After our meal, we got into a conversation with Lorenzo Lisi, an owner, who said that he and his partners were going to open a restaurant in Williamsburg, Brooklyn, which they found similar to the Trastevere neighborhood in Rome. The new place would be a version of Antica Pesa, one of the oldest restaurants in Rome, known for its classic Roman cooking. I love the food in all 20 regions of Italy, but as I have often said, if I were a rich man I would live in Rome. One of the main reasons is the food. At the table, we ordered the tasting menu. The highlights included perfectly fried calamari, marinated skate with sauteed escarole, linguine cacio and pepe, schiaffoni all’ amatriciana (a pasta resembling rigatoni, though I would have preferred it with bucatini) and a very tasty lamb crop. We brought our own wines and the corkage fee here is $25 per bottle. The beverage director, Gabriele Guidoni, is a true sommelier and before long we were having a discussion about Italian wine. 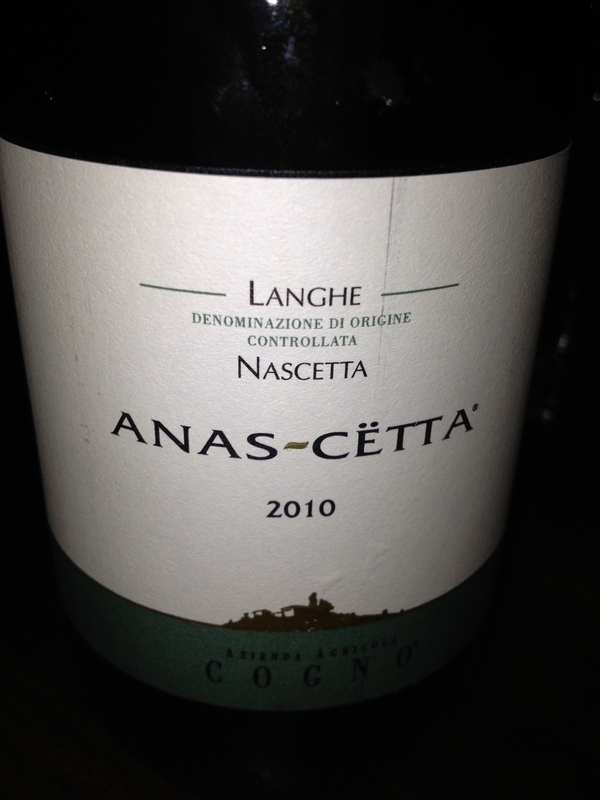 Langhe Bianco Nascetta- Anas- Cetta DOC 2010 Elvio Cogno. Made from the Nascetta grape (autochthonous Novello Bianco). This grape is of Mediterranean origin and might have originated in Sardinia. Cogno first produced the wine in 1994 and there are records of it going back to the 19th Century. He is one of the few that make it now. The Nascetta vineyards are at 350 meters and the 4,000 vines per hectare are vertical trellised with Guyot pruning. Harvesting is at the end of September. The wine is vinified in 70% stainless steel and 30% in barriques. It is aged 6 months in stainless steel and 6 months in barriques and is 180 days on the lees. After 3 months of bottle age it is released. I visited this winery a few years ago and Valter Fissore, Elvio Cogno’s son-in law and the wine maker, said that it has a mineral character but when it ages, it resembles Riesling! It is a very elegant wine with good fruit, a long finish and great aftertaste. Trebbiano d’Abruzzo 100% DOC 2005, Edoardo Valentini. The winery is organic and biodynamic. This is a very complex and full bodied wine with a mineral character, hints of citrus fruit and apple, good acidity, great finish and aftertaste and an extra something that is difficult to describe. The wine is aged in large botti of Slavonia oak for 24 months. I do not like to compare types of wine, but if asked what other type of wine this reminded me of, my answer would be a great white burgundy. In one of her books, Jancis Robinson says that the grape for this wine is not Trebbiano d’Abruzzo but Bombino Bianco. When this question came up when I was at the winery, Edoardo Valentini said that the grape was a special clone of Trebbiano d’ Abruzzo. 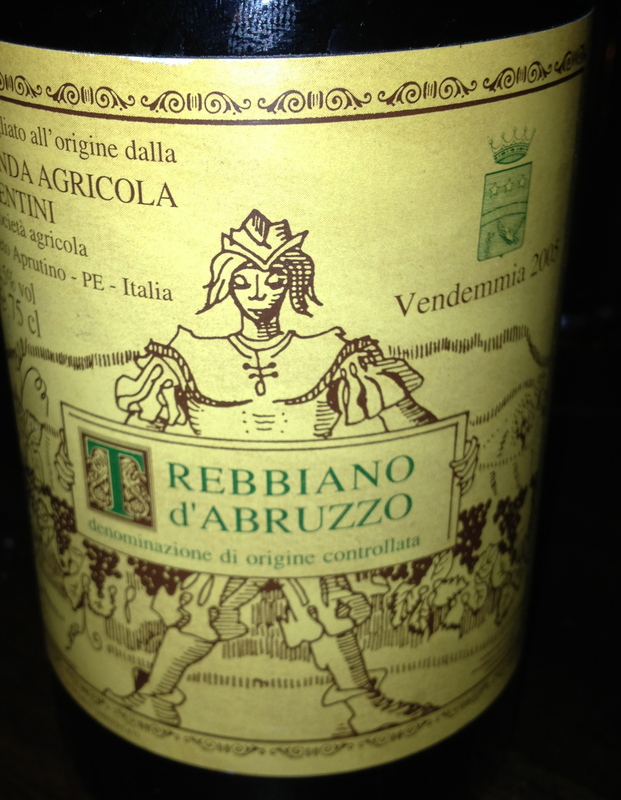 Both the importer and Edoardo’s son, Francesco say it is Trebbiano d’ Abruzzo. 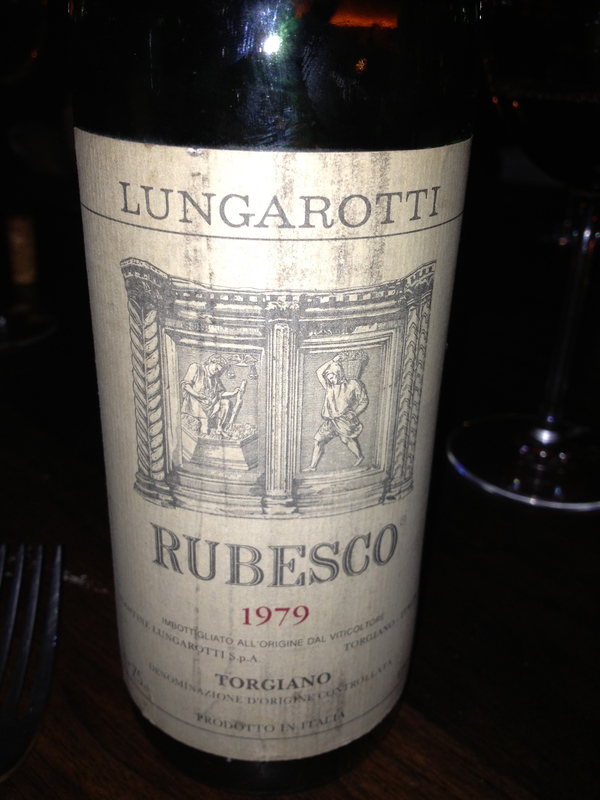 Rubesco Rosso di Torgiano DOC 1979 Lungarotti 70% Sangiovese and 30% Canaiolo. The soil is clay and sand of medium depth with limestone subsoil. There are 4,000 vines per hectare and the harvest takes place in September/October. Fermentation takes place in stainless steel tanks with 18 days maceration on the skins. It is aged for 12 months in oak casks and lightly filtered before bottling. This is a wine with red fruit aromas and flavors, hints of black cherry and a touch of leather and spice with a very pleasant finish and aftertaste, Note: this was NOT the Vigna Monticchio but the regular Rubesco which made it even more impressive! 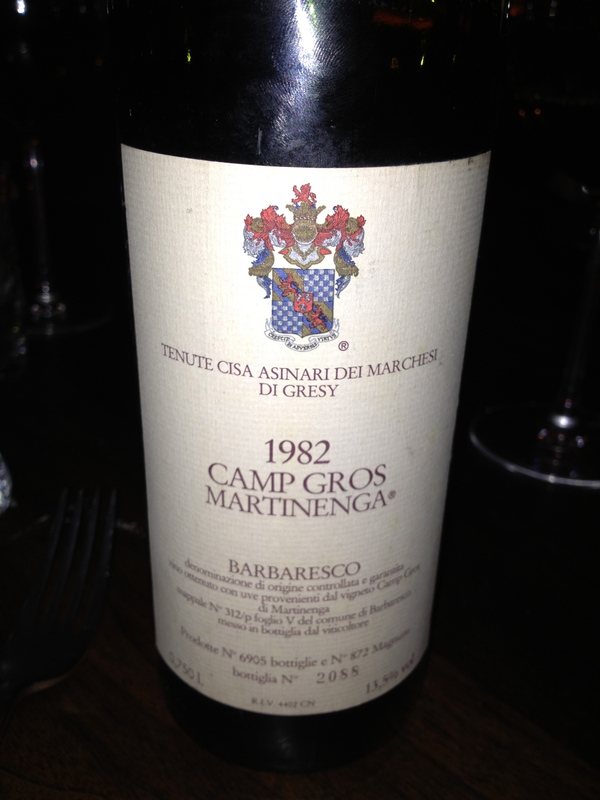 Barbaresco Campo Cros Martinenga 1982, 100 % Nebbiolo Tenuta Cisa Aisnari dei Marchesi di Gresey. 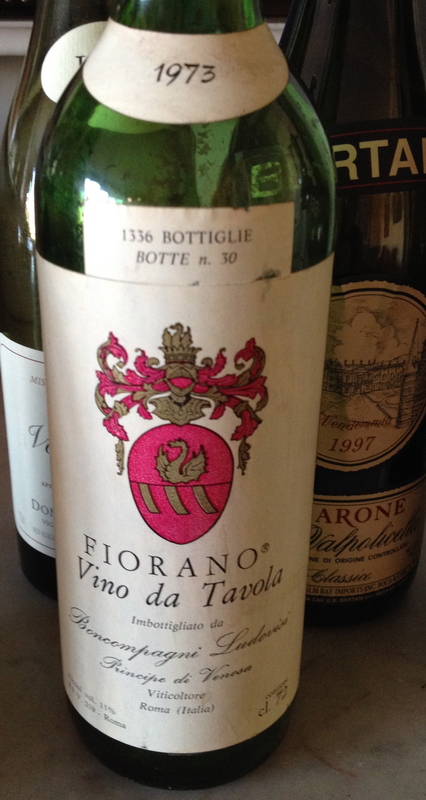 In his book the Italy’s Noble Red Wines Wasserman describes the wine as: “Tobacco and cherries on aroma; full of flavor, extremely well balanced; long finish the best Martinegna to date.” This is his note from 1985; I tasted the wine with him a few years later and was very impressed. 30 years later his description still stands and the wine is at its peak. Wasserman also says that the 1982 was almost perfect and gives the vintage four stars, his highest rating. He gives the wine three stars with a possible four. After drinking it with dinner I give it the extra star, too. Amarone 1961 Bertani 70% Corvina Veronese, 30% Rondinella-this is the present blend. Carefully selected grape bunches are hand-harvested in Bertani’s best Valpolicella vineyards in Fumane, Marano and the Novare Valley. Vines are cultivated using the “spalliera” method while pruning is done using the Guyot method with 5.000 vines/ha. Harvest begins in early October and extends over a two-week period. After harvest, ripe, unblemished grapes from the uppermost portions of each cluster — those grapes richest in sugar and extracts — are painstakingly detached and laid out to dry on cane mats. The mats are stored on raised platforms in airy lofts, sheltered by a roof but otherwise exposed to drying breezes on all sides. By the time they are ready to undergo maceration and fermentation in February, they will have lost up to 60% of their water content (appassimento). A lengthy maceration period ensues, a factor responsible for Amarone’s tremendous body and structure. After a controlled fermentation, the wine is transferred into oak casks for a period of 5-8 years (the 1961, I believe, spent a longer time in wood) during which it was racked twice annually prior to bottling. Dry, full-bodied, and amply structured with hints of cherries, red berries and spice. The wine was showing its age. 1961 was a very good vintage for Amarone. Prior to our lunch at Gramercy Tavern in NYC, a friend, who dines there regularly, selected the menu. He selected each of the courses to go with one of the wines we would be drinking. The seven diners were supposed to bring one wine each. Somehow we wound up with nine. It was one of those rare occasions were everything worked out perfectly – – the wine, the food and the company. Cédric Bouchard. I have never tasted any Champagne from this producer and was very impressed by this one. I believe he only produces single vintage, single vineyard wines and that they are fermented and aged in stainless steel. The winemaker interferes in the process as little as possible. It was also different from other Champagnes. The bubbles were very small and it had a crisp, fresh taste with subtle citrus fruit flavors that would make it go very well with food. He also makes a Champagne from 100% Pinot Blanc! Sauternes 1997 Château d’ Yquem made from 80% Sémillon and 20% Sauvignon Blanc. Harvesting is by hand. Successive waves of pickers are sent into the vineyard and the grapes are picked one at a time. This is to ensure that only the grapes with the “noble rot” Botrytis are selected. The grapes are pressed three times and then aged in oak barrels for 3 years. 1997 is considered a great vintage. Château d’Yquem will not produce a 2012. 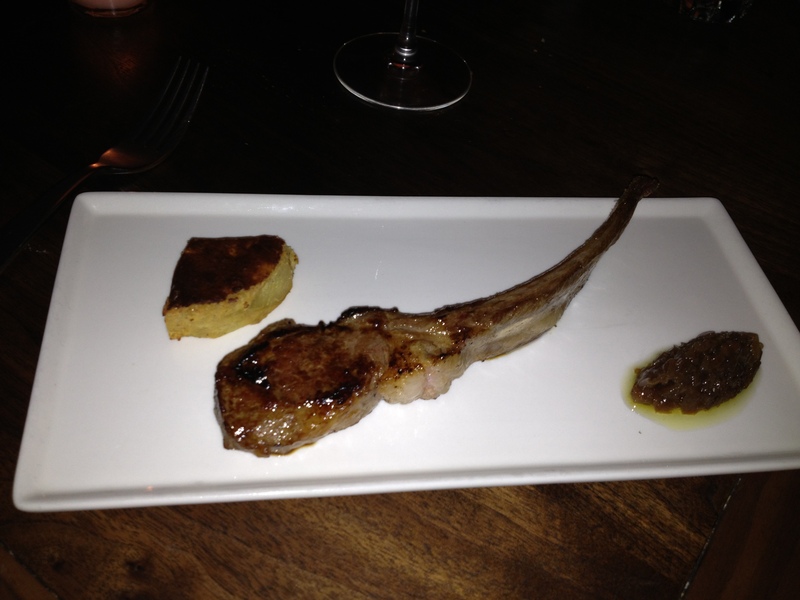 We had this with the Foie Gras with Poached Quince, Walnuts and Pomegranate Vinaigrette. Wonderful! Montrachet “Côte de Beaune” 2005 Louis Jadot made from 100% Chardonnay. 2005 was a very good vintage with almost perfect conditions. The wine is fermented in wooden barrels and aged for 18 to 20 months in wooden barrels before it is bottled. This is a big rich wine and will last for a number of years. This is a wine that I have drunk a number of times and always enjoyed. I believe it is at its peak now but should hold for a few more years. 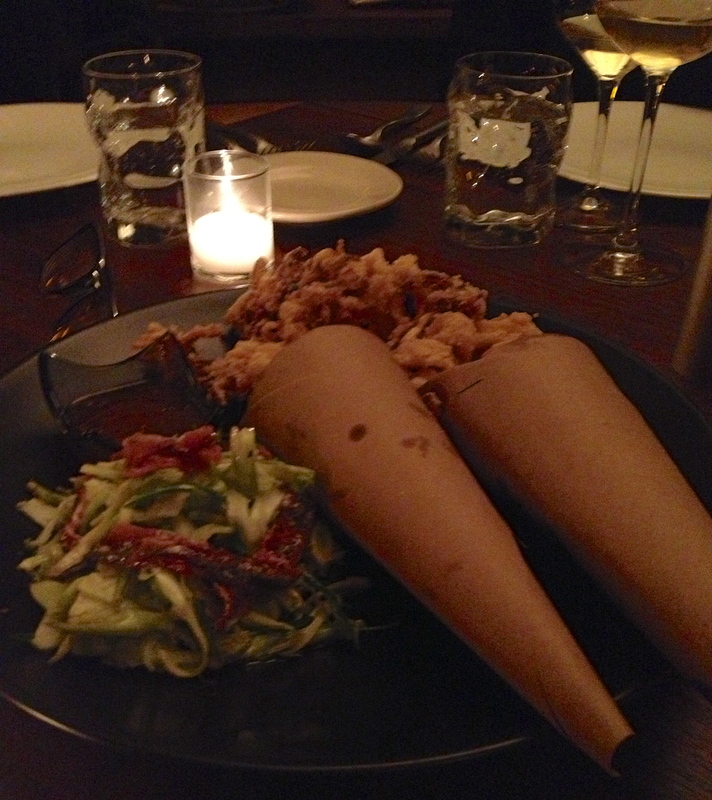 These two white wines were served with Striped Bass with Leeks Beacon and Brussels Sprouts. Gevry Chambertin Corbeaux 1985 Domaine Leroy 100% Pinot Noir This is a great Burgundy from one of the top producers and it was exceptional. Barolo 1971 Serralunga d’Alba Pira 100 % Nebbiolo. Sheldon Wasserman in his book Italy’s Noble Red Wines says that “Luigi Pira was… the single finest producer in Barolo” Pira was a traditionalists and the crushing of the grapes was by feet. The grapes were brought into the cellar, the bunches were put into tini, large upright oak vats’ and the men crushed them with their bare feet and the wine was fermented. Luigi Pira died in 1980 and the tradition of pigiatura a peidi died with him. Wasserman gives the vintage and the wine four stars, his highest rating. Some 32 years after Wasserman tasted the wine I would have to agree with him. We had these two wines with Duck Breast with Lentils, Parsnips, Hazelnuts and Trumpet Mushrooms. Bordeaux Château Montrose 1983 Saint-Estêphe made from 65% Cabernet Sauvignon, 35% Merlot and 5% Cabernet Franc. This wine was at its peak and I think it will remain there for a few years. 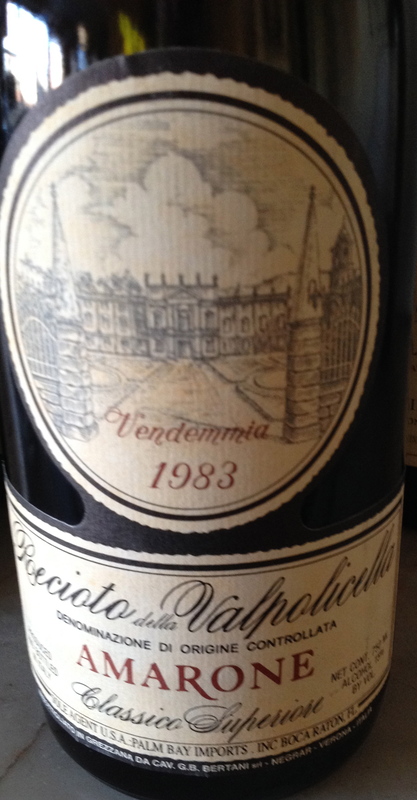 In my opinion 1983 was a very good vintage in Bordeaux but it was overshadowed by the 1982’s. The 1983’s are a good buy if you can find them. The wine was drinking very well, soft, with hints of dark fruit, spice and just a touch of leather. Amarone 1964 Bertani 70% Corvina Veronese; 30% Rondinella- this is the present blend. Carefully selected grape bunches are hand-harvested in Bertani’s best Valpolicella vineyards in Fumane, Marano and the Novare Valley. Vines are cultivated using the “spalliera” method while pruning is done using the “Guyot “ method with 5.000 vines/ha. Unlike most leading Amarone producers, who buy grapes from outside growers, Bertani’s harvest originates entirely in the firm’s own vineyards. With marly-calcareous soil sheltered by surrounding woodland, these vineyards offer the ideal terroir for Amarone. Harvest begins in early October and extends over a two-week period. After harvest, ripe, unblemished grapes from the uppermost portions of each cluster — those grapes richest in sugar and extracts — are painstakingly detached and laid out to dry on cane mats. The mats are stored on raised platforms in airy lofts, sheltered by a roof but otherwise exposed to drying breezes on all sides. By the time they are ready to undergo maceration and fermentation in February, they will have lost up to 60% of their water content (appassimento). A lengthy maceration period ensues, a factor responsible for Amarone’s tremendous body and structure. After a controlled fermentation, the wine is transferred into oak casks for a period of 5-8 years (the 1964, I believe, spent a longer time in wood) during which it is racked twice annually prior to bottling. Roasted & Braised Lamb with Broccoli and Ruby Crescent Potatoes. Here is the vintage report: Winter rainfall from October to March was 40cm, which was slightly above average. A very dry spring followed by rain in May and June. From July to October almost no rain fell and the vintage was made under ideal conditions. Picking started on the 21st September and bunches were in perfect condition and completely free from disease. Sunny days and cool nights resulted in musts with tremendous depth of color. Yields were high. 1970 was an excellent vintage. This is a 42-year-old port that will still last for a number of years. It has aromas of red fruit, ripe raisins, caramel and a hint of spice among others. The wine has great depth but also very subtle, balanced with a long full finish and after taste. We had the port with a selection of farmstead cheeses.